Donors, leaders of nonprofits, and public policy makers usually have the best of intentions to serve society and improve social conditions. But often their solutions fall far short of what they want to accomplish and what is truly needed. Moreover, the answers they propose and fund often produce the opposite of what they want over time. We end up with temporary shelters that increase homelessness, drug busts that increase drug-related crime, or food aid that increases starvation. How do these unintended consequences come about and how can we avoid them? By applying conventional thinking to complex social problems, we often perpetuate the very problems we try so hard to solve, but it is possible to think differently, and get different results. 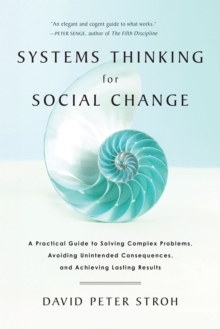 Systems Thinking for Social Change enables readers to contribute more effectively to society by helping them understand what systems thinking is and why it is so important in their work. It also gives concrete guidance on how to incorporate systems thinking in problem solving, decision making, and strategic planning without becoming a technical expert. Systems thinking leader David Stroh walks readers through techniques he has used to help people improve their efforts to end homelessness, improve public health, strengthen education, design a system for early childhood development, protect child welfare, develop rural economies, facilitate the reentry of formerly incarcerated people into society, resolve identity-based conflicts, and more. The result is a highly readable, effective guide to understanding systems and using that knowledge to get the results you want.